On first viewing Boston Dynamics' latest creation, the LS3 (Legged Squad Support System), I could not help but be taken back to the AT-AT (All Terrain Armoured Transport) walker, as depicted in the Star Wars film The Empire Strikes Back. But it is the AT-TE (All Terrain Tactical Enforcer) walker that appears in Attack of the Clones which strikes the most eerie resemblance to the LS3 concept, as the two images below demonstrate. 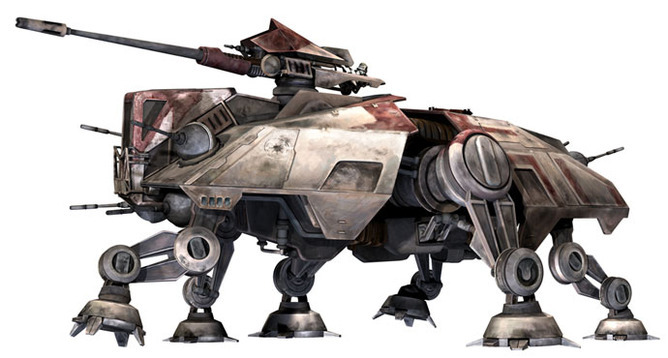 The AT-TE is a six-legged walker that appears in Attack of the Clones, Revenge of the Sith, and The Clone Wars multimedia campaign. Star Wars toys have become, it seems, real-world creations. The only discernible difference is that the AT-TE is a six legged beast, while the LS3 has been dubbed the “packed mule”. 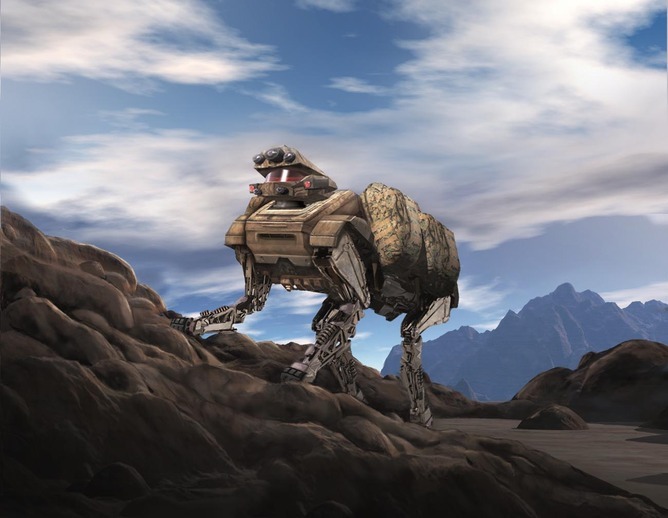 According to Boston Dynamics – which made its name with the development of the BigDog quadruped robot in 2005 – the LS3 has been designed to accompany war fighters into battle, carrying 180kg payloads and freeing up troops that would otherwise be carrying such equipment themselves. The demonstration video below gives a sense of the LS3 in action. LS3 – Legged Squad Support System Demonstration Video. One cannot help thinking this packed mule could serve a variety of functions in a war, as its real-life counterpart did in the Great Wars. In other words, the LS3 won’t just be carrying the necessities of water, food, shelter and medical supplies – it’s more than likely it will be carrying the instruments of war. Scope creep will dictate that the so-called “payloads” being carried might well include artillery ammunition. What you’ve then got is not only a transport vehicle but a tactical enforcer for the army and marines that could replace soldiers at the war-front altogether. This machine, which at times is reminiscent of a modern day centaur (compare the images below), also puts a whole new connotation to the idea of a suicide bomber. 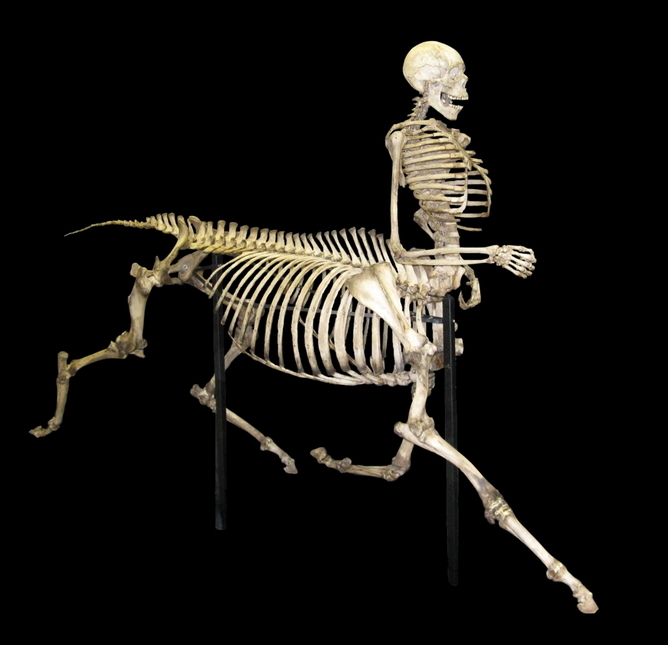 Centaur skeleton of human and equine bone, on display at the International Wildlife Museum in Tucson, part of an art installation by sculptor Bill Willers. 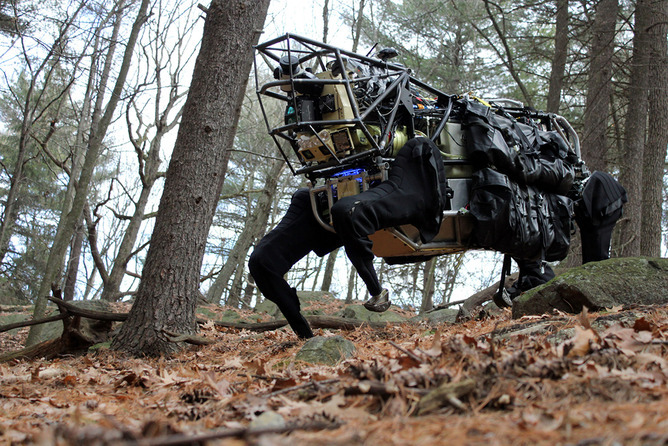 Built by Skulls Unlimited International, Inc.
[t]he vision for LS3 is to combine the capabilities of a pack mule with the intelligence of a trained animal. The LS3 is capable of tracking certain visual and oral commands and uses GPS (Global Positioning Systems) and computer vision to guide itself. Until the latest iteration of prototyping it was difficult for soldiers to hold a conversation near the LS3 without the robot picking up the discussion and acting on the voice commands. But the new LS3 has overcome these challenges. Additionally, it now comes with a 32km range in between refuels and can operate for a whole day without stopping. At the same time it suffers from no psychological shortcomings, it does not bleed, and is capable of lifting itself up after being turned on its side. LS3 is a dynamic robot that has been funded by DARPA, bringing together an interdisciplinary team of experts, including engineers and scientists from Bell Helicopter, AAI Corporation, Carnegie Mellon University Robotics Institute, NASA’s Jet Propulsion Laboratory at the California Institute of Technology, and Woodward HRT. At its demonstration launch last month, the legged robot completed trotting and jogging mobility runs, perception visualisation and a soldier-bounded autonomy demonstration. Anyone from the engineering fraternity watching the demonstration video at the top of this article would be awed at what has been achieved in the space of two years – beyond that of other Boston Dynamic creations such as the Cheetah (see video below), which can reportedly run faster than Usain Bolt. Boston Dynamics' “Cheetah” holds the landspeed record for legged robots. Now, putting all those features together, we have a dynamic robot that can perceive its environment and react accordingly. The aim of these uninhabited ground drones is to be able to go anywhere people and animals can go, whether the terrain be rock fields, mud, sand, vegetation, railroad tracks, up slopes or stairways. It would be no stretch of the imagination to think these robots, that can travel up to 11km/h on a flat surface, might one day find themselves policing our streets and neighbourhoods. But the feature that is the stuff of nightmares is the drone’s ability to follow a human leader and track members of a squad through rugged terrain. This may one day lead to drones autonomously tracking down people from “most wanted” lists in suburbia. Our children will be raised in a world where their nightmares roam real streets, and the line between detecting sci-fi from reality will be blurred. Even the best laid plans go awry. While Chewbacca’s walker in Return of the Jedi moved through the forest, firing laser blasts at unsuspecting stormtroopers, and destroying other Imperial walkers, there won’t be any Chewies in these drones, just a whole lot of artificial intelligence. These mechanical monsters might help turn the tide of battle during wars on Earth, so long as they are driven by those on the right side. And that is an entirely different question, isn’t it? The author would like to thank her fellow collaborator Dr MG Michael, previously an honorary senior fellow at the University of Wollongong, NSW, Australia, for his insights and valuable input on the initial draft of this article. Katina Michael has received funding from the Australian Research Council (ARC). She is a senior member of the Institute of Electrical and Electronics Engineers (IEEE), a board member of the Australian Privacy Foundation (APF), and a representative of the Consumer Federation of Australia (CFA).